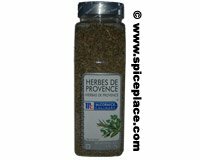 McCormick Herbes De Provence is a classic blend of herbs widely used in French cooking. These are floral herbs that flourish in the hills of France including Rosemary, Marjoram, Thyme, Sage, Anise Seed, Savory and Lavender. Add Herbes de Provence to chicken, pork, fish, veal and shrimp recipes. Herbes de Provence adds an excellent flavor to stuffings, marinades, and salad dressings. Add Herbes de Provence to mashed potatoes. Herbes de Provence are excellent in red or white pasta sauces, gravies, soups and soup stocks, where an herb character is desired. Blend Herbes de Provence with grated parmesan cheese and put in shaker bottles on the dinner table. Herbes de Provence are great in dips or sprinkled over freshly steamed vegetables. Sprinkle a little Herbes de Provence on grilled meats just before serving. Herbes de Provence can also be added to mayonnaise or other sandwich spread recipes when preparing. Herbes de Provence is a perfect compliment to seafood. For each 4 servings in the recipe, add approximately 1 teaspoon of Herbes de Provence (or 1/4 tsp per serving). Ingredients: Rosemary, Marjoram, Thyme, Sage, Anise Seed, Savory and Lavender. Net Weight: 6 ounces 170g.